With the holidays, come dinner invitations and one usually likes to bring along a bottle of wine. However, more often than not, the wine you bring doesn’t get opened as the host already has another few in mind to match the meal. This proves frustrating as you may have pulled something special or rare from your cellar or purchased a specific bottle for the event that you really want to taste. What to do? 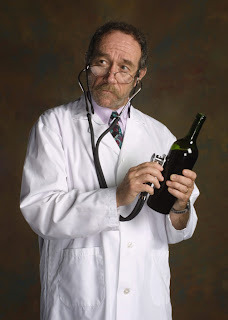 To ensure your wine is opened at the dinner, the “Good Doctor” suggests this. Call ahead and ask the host what the menu is because you want to bring a unique bottle to match a dish. This subtle gesture is viewed as considerate almost always ensuring that the wine you bring will be consumed.